Well, the show is finally over! Whew...! My husband and oldest were in a musical together..."Beauty and the Beast" to be exact. My husband was the beast. I love telling people that he played that role long before this musical! He enjoyed it from beginning to end, but we are glad to have our lives back, especially right before the holidays. Overall, the show wasn't bad. They could've used another week of rehearsals, but they still pulled it off pretty well. On the negative side, audio problems existed during the entire weekend, the actor who played Maurice was less-than-convincing to be kind, and the transformation was incredibly lame as there was not one single special affect. My poor husband struggled with his voice all weekend. All the growling and singing all week caught up with him, and he struggled through his solos each time, which is a shame because they really are beautiful songs made only for the stage version, so you don't hear them in the movie. His mask also muffled his beautiful voice. 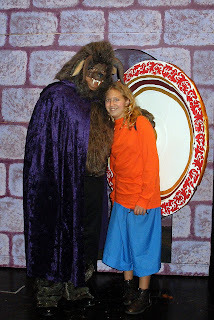 But overall, he was an excellent beast and I think most people thoroughly enjoyed him and the show. Kids always approached him cautiously at the end with parents to prove that he really was just a man in a costume! Belle was absolutely amazing! The lady who played her role was MADE to play Belle. I am not exaggerating when I say that I liked her better than Broadway's Belle (we have the CD). Her speaking voice, acting, and singing voice could double for the movie's version. Just incredible! We were so fortunate to have her! My daughter was in the youth ensemble, and she played a plate in the enchanted castle. She also enjoyed the whole process, and I think I had so much fun through her! She was a part of some of the best songs in the piece. It was an exhausting but incredibly fun experience that I am SO glad my family got to participate in. We are already looking forward to the spring production, but right now I'm glad to have some time off!